"Painting is the only art form except still photography which is without time. Music takes time to listen to and ends, writing takes time and ends, movies end, ideas and even sculpture take time. Painting does not. It never ends, it is the only thing that is both continuous and still." 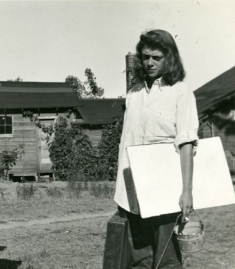 Feisty, enigmatic, and captivating, Joan Mitchell was a force of Art to be reckoned with. 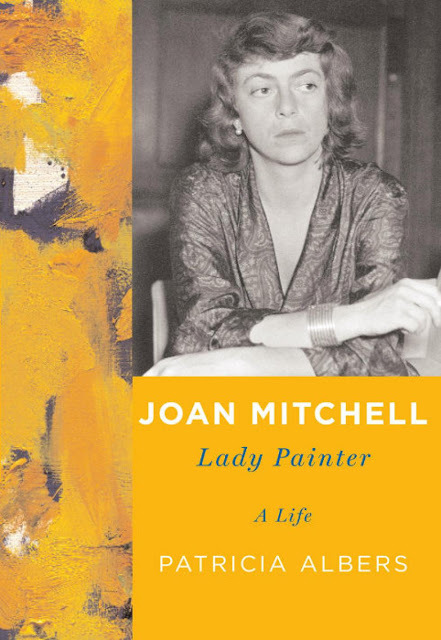 I recently finished Patricia Albers' biography of the artist, Joan Mitchell: Lady Painter: A Life. Having very little knowledge of Mitchell and her painting career, I was inspired to read about her because I had greatly enjoyed reading Lee Krasner's biography (read my review here). Though Mitchell's career overlapped Krasner's, and they certainly ran in similar New York Art circles in the 1950's, Joan's paintings were viewed by the Art world after the pioneers of Abstract Expressionism (Krasner and her husband Jackson Pollock, Hans Hoffman, Arshille Gorky, etc.) had already become widely visible. Still an Abstract Expressionist, she brilliantly carried the style well into the 1980's, ever increasing her work's impact and significance. Joan was born to an affluent family in Chicago. Her mother, Marion Strobel, was a gifted and very active poet, her father, Jimmie Mitchell, was a doctor, and her grandparents had a fortune (having built Chicago's bridges and worked for Andrew Carnegie). I enjoyed learning about the history of Joan's family, and the impact her heritage had on her art career. Always working hard to live up to her family's expectations, Joan was a good student, a talented poet and artist, and a champion figure skater. She occasionally tried to disguise her wealth, but often fared more fortunately than many of her art student colleagues. A graduate of the Art Institute of Chicago, Joan struck out and immediately began her career traveling and painting. She spent time in Europe and Mexico, usually with a wide circle of friends. Though Joan always felt "alone",and often depressed, she had an influential social life, and frequently rubbed shoulders with predominant artists, poets and musicians of her time. It was remarkable to read about all of these famous lives intersecting in New York and Paris. Life wasn't as glamorous as it sounds, however. Often seriously intoxicated, Mitchell led a reckless life of abuse and promiscuity. Her relationships with men always ended in disaster, and she frequently ended parties in fights. With the mouth of a sailor, she was aggressive and told it exactly as she saw it, regardless of the consequences. At times entertaining to read Albers' accounts of Joan's abhorrent actions, it is ultimately quite sad to see such a talented woman allow her own life to spiral out of control. Joan Mitchell was a brilliant painter with a talent to be respected. Her personal life aside, her ability to translate memories and emotion into paint on canvas is still remarkable. Highly influenced by Van Gogh, her painting, Posted (above), closely resembles his Irises. Like Van Gogh, Mitchell used vibrant colors and active brushwork to saturate the canvas with emotion. What may look like a tornado of brushwork, drips and color, is actually a highly calculated and controlled process. Remarkably, many of these paintings exceed 6 feet in their dimensions, and Mitchell continued to paint in such a grand scale almost all of her life, even when suffering from hip dysplasia and cancer. 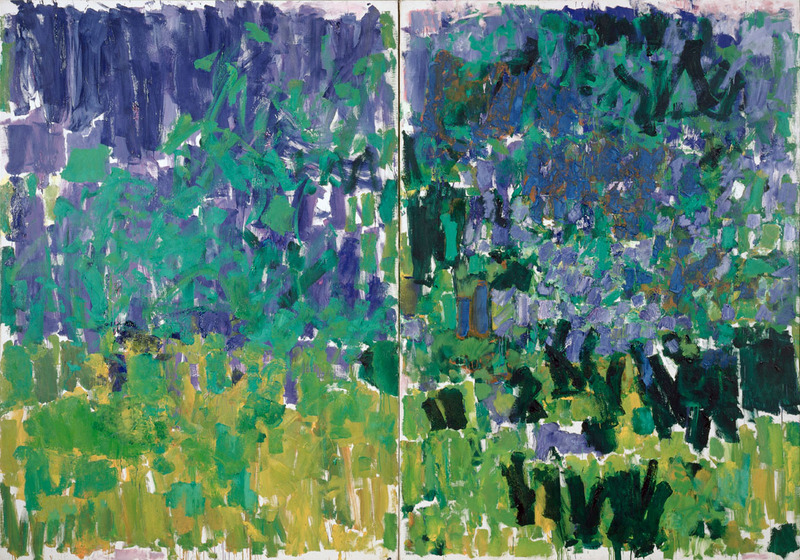 Joan Mitchell left behind a legacy. Her works have been widely collected by respected institutions, including the Whitney Museum of American Art, The Tate Gallery in London, and the Smithsonian American Art Museum. 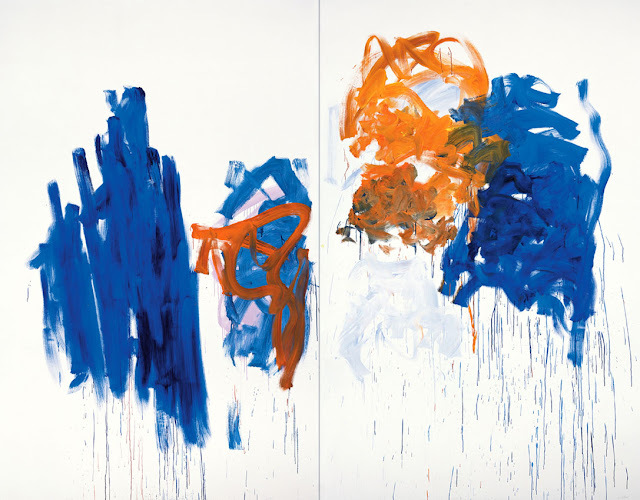 She established The Joan Mitchell Foundation, which serves to celebrate her career and support contemporary artists. She was an example to all future artists, especially women, that a successful career is built upon relentless pursuit of your passion. Patricia Albers has written a wonderful book. She has an amazing gift to lyrically and vividly convey the depth and significance of a painting to the reader. I have never read an author that so beautifully writes about color and paint. She describes precisely how they interact on a canvas. It felt like she was one with Mitchell as she was painting. That was a wonderful experience for me as a painter! Both Mitchell's glowing successes, and her humiliating failures have been accounted in this biography. Albers significantly researched Joan's heritage, influences and life events to write an authentic, complete biography of this beguiling "Lady Painter." Want to see what I am reading next? Head over to goodreads.com and check out my profile! Are you familiar with goodreads? It is a fabulous tool for finding new books to read! You can see what your friends are reading, read reviews of books, and share your own reviews with others. I love the "shelf" feature and keep track of all of the wonderful books I have read and hope to read in the future. Be sure to let me know if you are a member- I am always happy to follow another book lover! Thanks so much, Sondra! 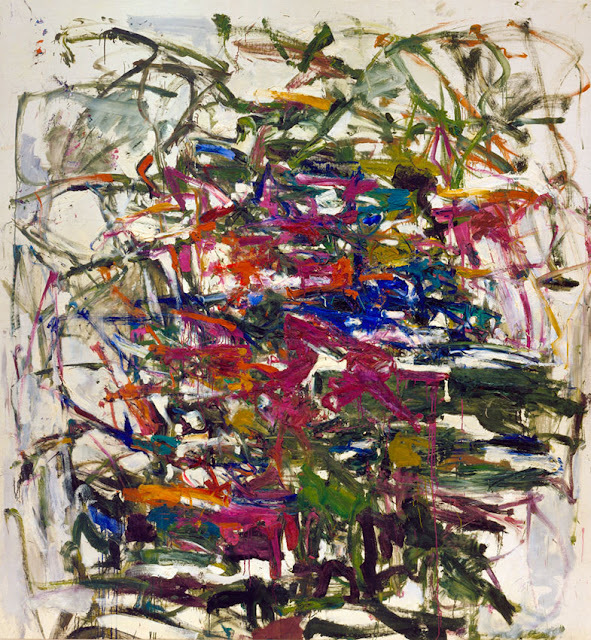 I really enjoyed learning more about Joan Mitchell and her work!